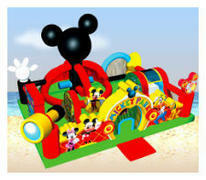 Call us today to book the Mickey Mouse Learning Club combo! Brand New Toddler Club Bounce House Combo. Jump, Slide, Obstacles, & ball pond, sized perfect for you little one. Easy overhead viewing from perimeter of unit. Great for keeping track of your little learner.